Romans 8: 1 Therefore there is now no condemnation for those who are in Christ Jesus. 2 For the law of the Spirit of life in Christ Jesus has set you free from the law of sin and of death. 3 For what the Law could not do, weak as it was through the flesh, God did: sending His own Son in the likeness of sinful flesh and as an offering for sin, He condemned sin in the flesh, 4 so that the requirement of the Law might be fulfilled in us, who do not walk according to the flesh but according to the Spirit. My whole theme for this year’s Big Event has been Blessing. I have practiced what I preached about trying to use my voice to bless others as I went about my Christmas preparation. It’s been a revelation to me that if your mindset is to do that, opportunities just seem to pop up where saying “God bless you”…for whatever…seems natural and right. It bears repeating all year long.. Your Savior has been born! Remembering the Big Event has come to an end. Now I’d like to introduce you to the grown-up Jesus of Romans 8. This is the Savior with treasured gifts for you this Christmas morning; forgiveness, freedom and fulfillment. I know this Jesus well. I had a very special dream as a relatively new believer more than half a lifetime ago. Jesus had come to take me to see something with him. He held my hand as we looked at a grotesque museum style head-and-shoulders statue sitting alone on a pedestal in the room. It wasn’t until we were leaving and I turned to take one last look at that ugly thing that I saw it was me. That was “my” dream but It has a reality that’s become my blessing for you this Christmas Day. You have a grown-up Savior who loves you enough to hold your hand while you take one last look at who you “were.” It’s time to open those gifts of forgiveness, freedom and fulfillment. That is no longer who you “are.” Your Savior has been “born again” into your heart’s memory this December. Merry Christmas and God Bless One Last Look. Isaiah 11:1 A shoot will come up from the stump of Jesse; from his roots a Branch will bear fruit. 2 The Spirit of the Lord will rest on him— the Spirit of wisdom and of understanding, the Spirit of counsel and of might, the Spirit of the knowledge and fear of the Lord—3 and he will delight in the fear of the Lord. 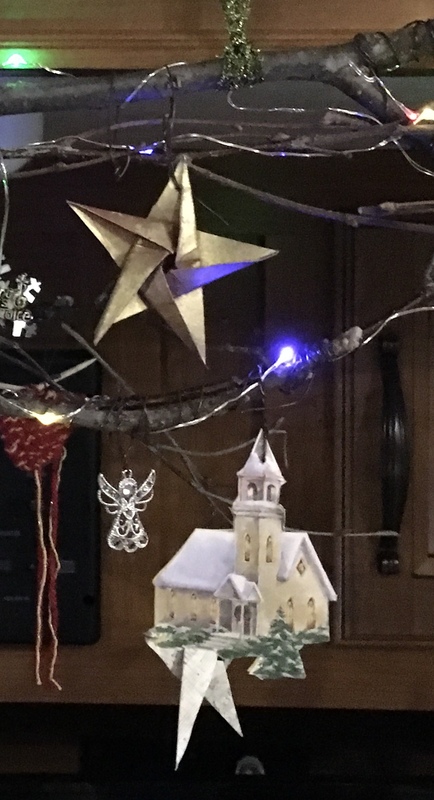 My only other “Jesse Tree” was made for a church decoration years ago early in my own faith journey. 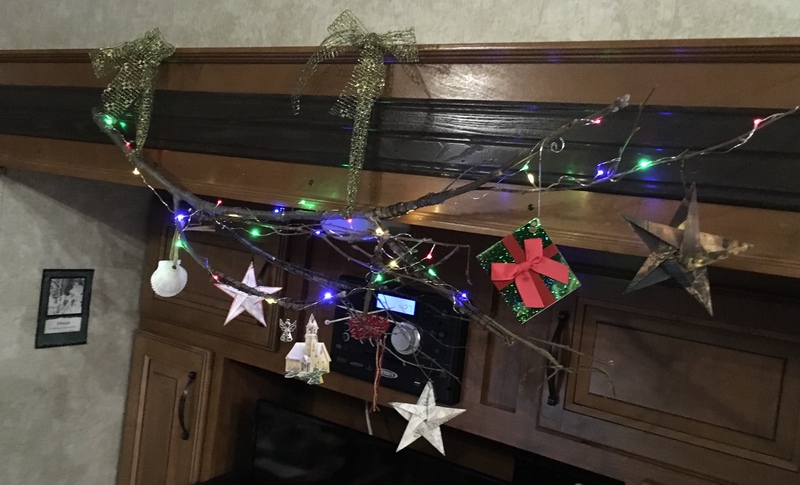 I was caught up with the idea of a simple branch as a decoration. This year it’s different. The origami Stars are folded around the Word of Light for each post to help me remember. 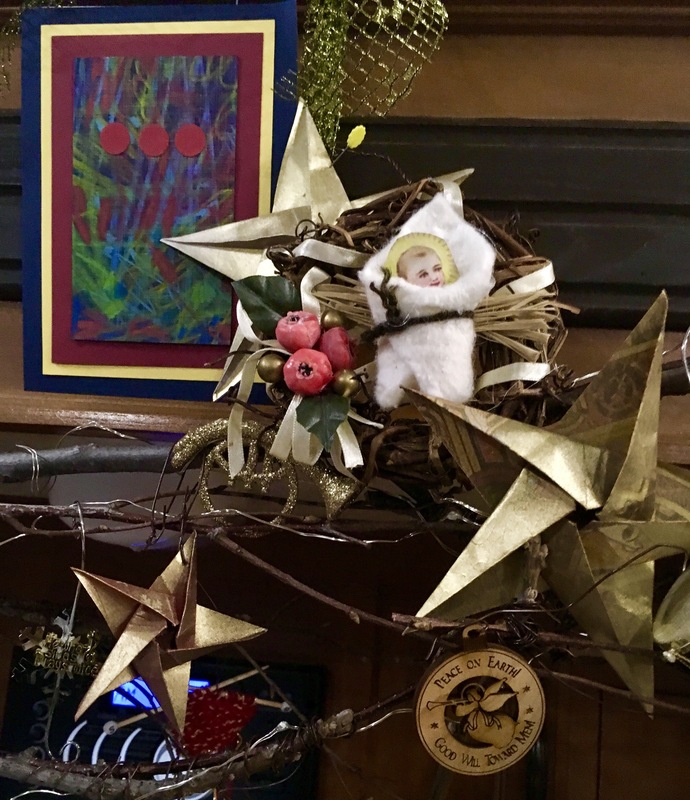 The ornaments for the days in between posts represent ways I do remember God has worked in my life. This year the Jesse Tree is more than a decoration. There’s a little piece of knitting to remember my first real awareness that God could use ordinary hands and a pair of knitting needles for his purposes. Prayer Shawls were knit with nothing more than those hands and trust that God would open my eyes to recognize a connection he’d made between his heart and my hands to know who should receive that shawl. Giving away those shawls was an unexpected gift that changed my life in ways I could never have imagined. This year the Jesse Tree is my visual reminder of why I choose to spend these days remembering the Big Event; the birth of our Savior. I can see with my own eyes how the branch is changing as the ornaments are added each day. They are the gifts received, remembered and returned that make the branch beautiful and add Isaiah’s capital “B.” God bless the fruit of the Branch. 3 Grace and peace to you from God our Father and the Lord Jesus Christ. 4 I always thank my God for you because of his grace given you in Christ Jesus. 5 For in him you have been enriched in every way—with all kinds of speech and with all knowledge—6 God thus confirming our testimony about Christ among you. 7 Therefore you do not lack any spiritual gift as you eagerly wait for our Lord Jesus Christ to be revealed. This is the week to focus on getting Christmas gifts sent out. There’s a humorous ad running on TV this year about the things you can count on at Christmas, one of which is getting package delivery notifications via email and the other is Aunt Somebody going off-list and giving you something you won’t use at all. Choosing the right gift to give is definitely an art. Thankfully God never goes off-list and he’s an artful gift giver. This Scripture is clear we’ve been “enriched in every way – with all kinds of speech and with all knowledge.” Spiritual gifts are a popular topic but this gift, words and thought, doesn’t appear in any of the lists I’ve read. I wonder why? Think of it…a gift that makes you smart enough to never again have to wish you could eat the words you’d just spoken. The extra bonus would be Grace that would impact all your words and the dreaded “tone of voice” that sometimes belies them. It’s a gift that keeps on giving. You know that saying “it’s more blessed to give….? That’s given me an idea. I’m going to find a special digital gift box this Advent. Then I’m going to fill that box with 26 days, or so, of personal Thank You Notes for being able to use that gift of words and thought. It’s may not be perfect, yet, but it’s the best gift I have to offer this year: daily delivery notifications and no worries about going off-list.